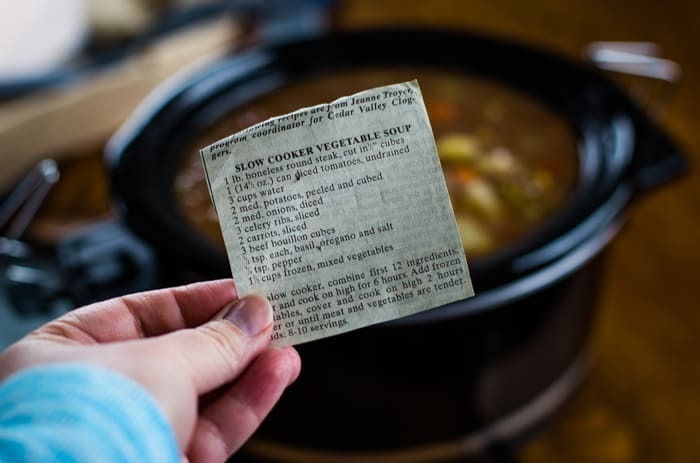 Hearty homemade slow cooker vegetable beef soup flavored with basil, oregano and salt. 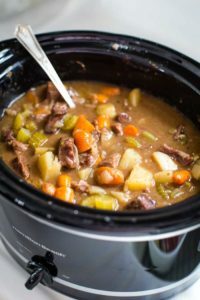 An easy recipe because of the base of delicious carrots, celery, potatoes, stew meat and frozen vegetables. With all the chilly, snowy days we’ve been having in Ohio, I’ve been wearing out my crockpot making soup almost each and every single night. 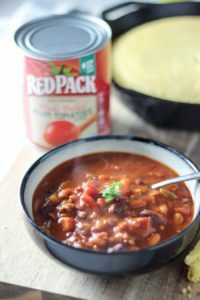 There’s something so nice about getting dinner ready in the morning and then having a hot bowl of hearty soup ready whenever we’re sitting down to dinner. 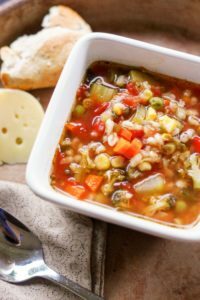 Sometimes I’m craving a thick beef stew and sometimes I want this very vegetable soup I’m sharing with you today. You quite literally throw everything into the crockpot and let it goooooo. It’s packed with flavor from the oregano, basil and salt. So much so, I didn’t change the recipe at all! It’s made with frozen vegetables just like mom used to make. Easy. Always on hand. And packed with color. You don’t have to brown the stew meat before you get started. Sure, some say it adds flavor. If you really want to, go for it. Otherwise, be like me and throw it all in there. Step 1: Cut up all the vegetables (except for the frozen ones, we’ll get to those later) and meat. You can do this step the night before if you’re going to be throwing this into the crockpot on the morning of a busy work day. Step 2: Pack all the ingredients into your slow cooker. There’s no science in the order. Step 3: Give all the homemade vegetable soup ingredients a good stir. Add the diced tomatoes, water, beef bouillon, basil, oregano and pepper. Step 4: Cook on high in the slow cooker for six hours. Add the frozen vegetables and cook for an additional two hours or until the meat and vegetables are tender. 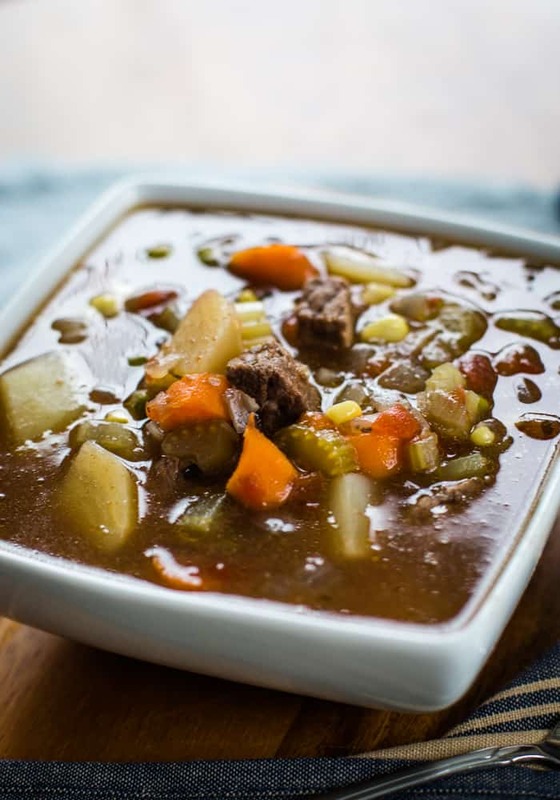 This recipe makes the most tender, juicy and flavorful vegetable beef soup. The leftovers are amazing as well! Enjoy! 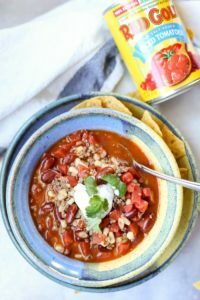 What size slow cooker do you need to make this recipe? This recipe using a four quart crockpot to the max. A five or six quart crockpot can be used as well. What kind of beef bouillon do you use? I only use Better Than Bouillon. I keep some on hand at all times which means I never need to buy broth because I can make my own. For this recipe I used the Organic since I’ve found it has less fillers. Can I add the frozen vegetables to the soup at the beginning? Yes. They may end up being a bit more soft but it is possible to add them at the beginning if you’re setting the crockpot to cook all day and can’t be there to add the vegetables. Do you have to thaw the frozen vegetables first? No. Just throw them into the crockpot with all the remaining ingredients. What kind of frozen vegetables do you use for vegetable soup? I typically grab a bag of mixed vegetables in the freezer section. However, this time I used a combination of peas and corn which is what I had on hand. 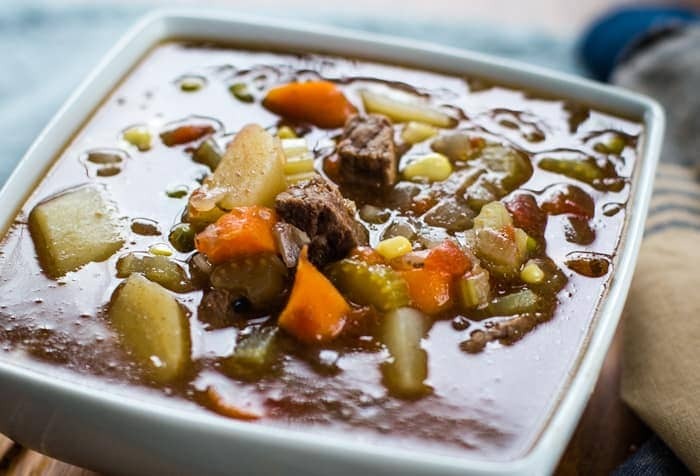 What kind of meat do you use in vegetable beef soup? 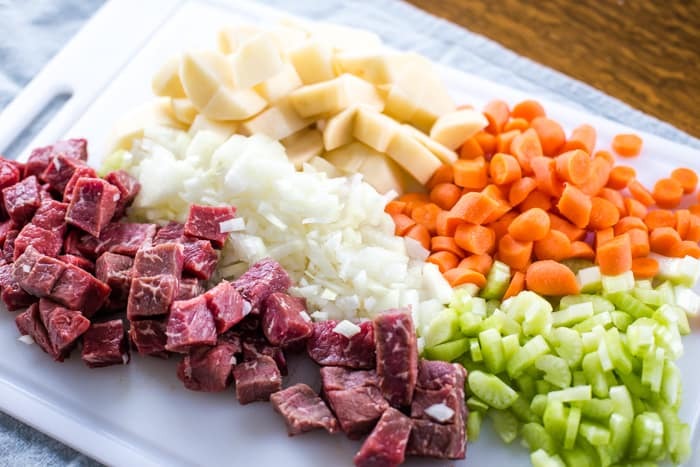 I use stew meat, chuck roast, chuck shoulder, chuck-eye roast or top chuck to make my soup. Really, it’s whatever is on sale at the store the week I plan to make it. 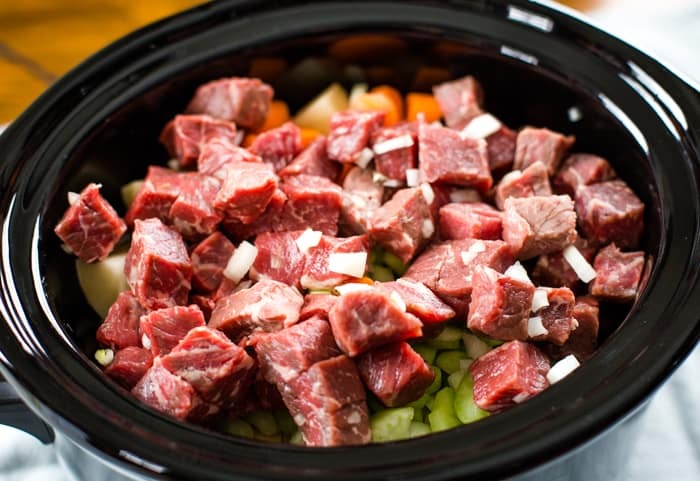 Do you need to brown the stew meat before you put it in the slow cooker? No. I didn’t. It’s one less pan to clean. However, some say it’s brings even more flavor so go for it if you want to. Do you need to stir the soup during the cooking process? I did stir it every few hours to keep the flavors working together. However, it’s not necessary to get a great vegetable soup. 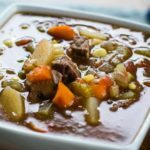 A hearty and flavorful slow cooker vegetable beef soup made with carrots, potatoes, celery, stew meat and frozen vegetables. 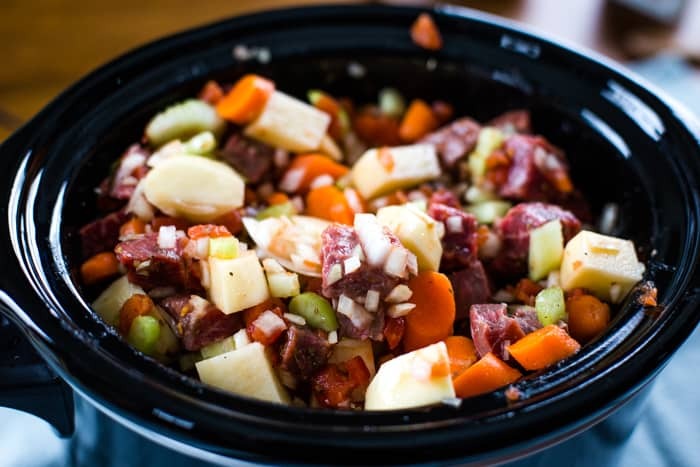 Prepare and chop meat, potatoes, onions, celery and carrots and add to the crockpot. 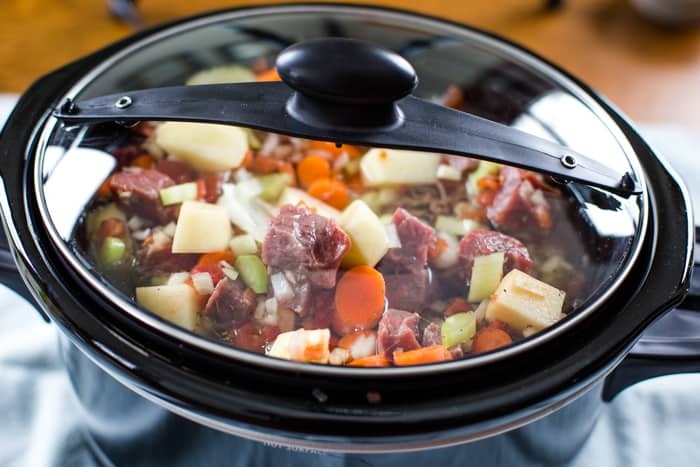 Add remaining ingredients to crockpot, except for the frozen vegetables. Cook on high for 6 hours. Add frozen vegetables and stir. Cook on high 2 more hours or until meat and vegetables are tender.